Welcome back to the Literary Sofa – I hope you enjoyed a long hot summer and some good books. This is a quick Hello, I’m back! and glimpse of the upcoming programme on the blog. I always know it’s been a good break when I come back raring to get stuck into everything, and there’s nothing like September for that. My August away from blogging, social media and writing didn’t go quite to plan, but in a good way. Once I’d stepped away from the first two and reclaimed my headspace, I had an unexpected burst of inspiration and spent the first half of the month on an entire new draft of my next novel. After that, it was time to send it off to its first reader and get an answer to the nagging ‘does this work at all?’ before tackling the ending, which is still to come. I’m incredibly fortunate to have a writer friend in the States who’s as insightful and constructive as any professional editor. 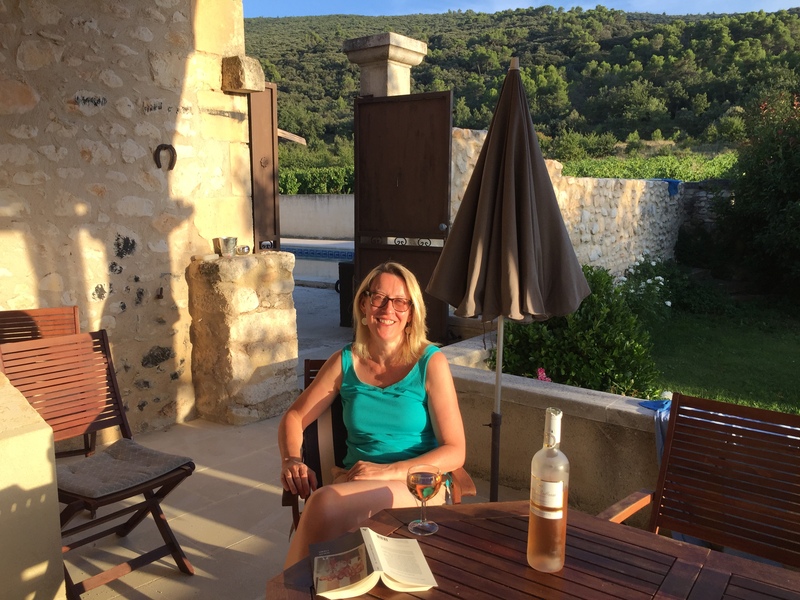 When our holiday finally came around, it was absolutely blissful to return to a place which is very special to our family in the Lubéron area of Provence. 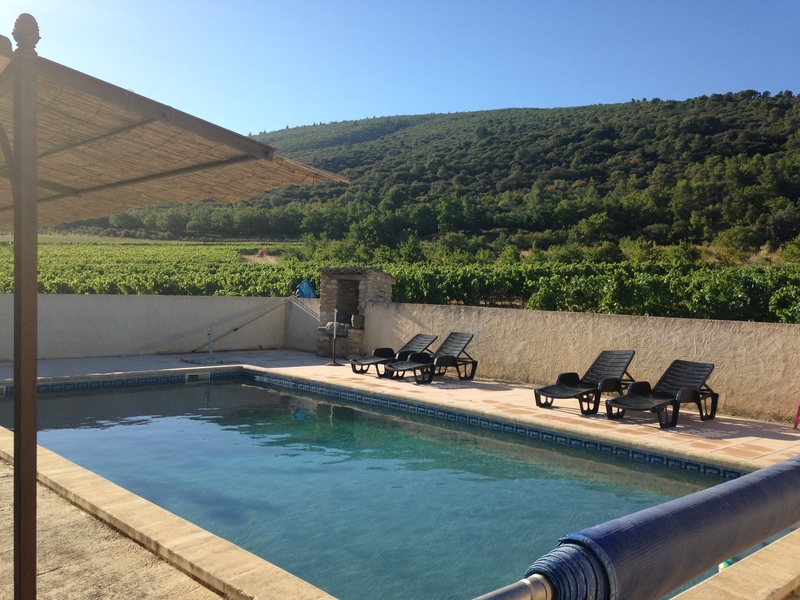 It was our eighth stay at this simple gîte on a vineyard at the foot of the mountain, in the wild and away from To Do lists, everybody and everything. I am generally useless at relaxing but I always manage it here, and the older they get, the more we treasure our sons wanting to spend time with us and each other. Our eldest was with us for most of the trip before flying off to start his year abroad in Senegal (we are visiting in February which is very exciting), and his brother has just started Sixth Form. My husband is still over there doing a 1000km bike ride in the Alps. We all have our own idea of fun… give me books and a pool and I’m happy. On my first day home I received such a thoughtful and encouraging response to my manuscript that I can’t wait to get back to it. It always amazes me what readers can see in my writing that I can’t – it’s given me so much to think about. There’s a lot of work to do, but as always I’m going to push myself to make it the best book I can write now the dreaded first draft stage is over. The bar is much higher when you’re no longer a debut novelist! So, let’s talk about BOOKS! Until August this had been a frustrating reading year for me. Working on my own new idea makes me horribly hard to please as well as cutting down my time to read (although I hasten to add that all the titles I’ve featured on the blog made the grade without compromise). Happily, August proved to be one of the most satisfying and stimulating reading periods I’ve ever had and I look forward to sharing my thoughts about all 15 of the books I read with you. Only one is a current hot title and that was deliberate. (My TBR needs to be determined more by my personal interests – many of my holiday choices were relevant in some way to my own writing – and less by the publishing calendar). Even if I keep it brief, it’s going to take two posts, which I’ll publish this weekend and next week. See end of post to find out what I’ll be including. As always, I have some fantastic guest authors lined up for later this month: Amanda Huggins, author of story collection Separated from the Sea will be contributing a Writers on Location post on Japan on 19 September, followed by a third visit from Claire Fuller, one of my favourite novelists, whose new release Bitter Orange is her best yet, and in early October I’ll be featuring a series of beautifully illustrated pamphlets from Word Factory in partnership with Guillemot Press. More guests will follow, but I’m going to try to write more of the content myself, something I keep saying and not sticking to. After a break last year, I will once again be running the Literary Lunch competition for the blog’s 7th anniversary in late September – it’s always been very enjoyable. I do hope you’ll keep me and my guests company on the Sofa this autumn. Good to see you back, and to hear the exciting news about your new draft. Not for the first time I feel incredibly inadequate (and I’m actually a pretty high achieving person). How do you manage to read 15 books in a couple of weeks’ holiday? We’ve just had our first two week holiday away without children in decades, and I felt quite proud of my achievement in reading six novels. Do you read from morning to night and do nothing else?! Ha! You’re worrying unnecessarily. I was only away for 2 weeks but that’s the reading tally for the whole of August and several of them were quite short (read Despentes’ essay in one afternoon/evening, and French novels tend to be shorter generally). As bloggers go I am not an especially fast reader but on this particular holiday I can put in about 6+ a day and it all adds up! Lovely pic of you isabel – you look so relaxed and happy. Great news on the initial feedback on your latest book – I’m not quite there yet with my WIP but I can appreciate how tense you feel at sending it out for the first time. All the best with your renewed drive to get it finished and I’m looking forward to reading more about your August book choices. I loved Home Fire too.